Biofilm (a group of microorganism) having a complex assembly of protein, polysaccharide, and DNA in a self-produced extracellular polymeric matrix and was found on various surfaces, including, natural aquatic or potable water system, living tissues, medical devices, etc. . Bacterial biofilms are widely studied in avoiding antibiotics, phagocytosis, and other disinfectant components. Biofilm communities in the natural environment have unique architectural features by interstitial voids, such as macro- and micro-colonies. The voids allowed the diffusion of nutrients, gasses, and antimicrobial agents through the biofilms; however, biofilm modulates their architecture in response to these changes in the external and internal process. Due to the proximity of cells, they exchange their quorum-sensing molecules, extra chromosomal plasmids and showed heterogeneous character in each biofilm community. Microbial resistance acquired temporarily or the permanent ability of an organism when multiplying under circumstances and would abolish or inhibit other members of the same strain . The antibiotics resistance is well known; however, food preservatives, disinfectants and resistance to antiseptics are comparatively under-explored. To regulate the gene expression in a coordinated fashion and mediate bacterial communication is also one of the hallmark mechanisms for resistance within a bacterial film . The biofilm resistance of the microorganisms has several economic and environmental implications, including medical implants, oil recovery, drinking-water distribution, papermaking, metalworking and food-processing . The bacterial attachments in the food and dairy industries are also well known related problems caused by biofilm mechanism . Antimicrobial agents target a range of functional hereditary material, enzymes, respiratory system and other cellular loci. However, due to genetic exchanges and inherent discrepancies such as exclusive cell envelope composition and non-susceptible protein diverse bacteria, react differently to bactericides. Bacterial biofilm has increased antibiotic resistance and involved in many persistent diseases. Inside biofilm, several mechanisms confer the multi-factorial resistance to antibiotics. In this review, we are highlighting the molecular mechanism of biofilm and the role of the matrix for antimicrobial resistance. Glycocalyx is an integral part of the biofilms, and its thickness varied from 0.2 to 1.0μm  and was reported in both gram-positive and gram-negative bacteria . Glycocalyx using electrostatic, Van Der Waal and hydrogen bonds forces for cohesion and adhesion of the biofilm with the solid surface  and that help in maturation of biofilm . The composition of glycocalyx is flexible and regulated with biofilm growth that supports pathogenic bacteria to survive in extreme adverse host environment . The components of the biofilm capsules such as glycoprotein and polysaccharides are influenced by in different environmental conditions. The resistance of bacteria against antibiotics and other components of antimicrobial agents are supported by glycocalyx matrix. Interestingly, glycocalyx layer accumulates antibacterial molecule up to 25% of its weight. The adsorption sites of the matrix limit the transportation of biocides and served an adherent for exoenzymes . The exoenzymes protect the motility of particular agents of antibacterial activity and provide a source of substrate for biocide metabolite degradation that resulted slowing down the activity of susceptible drugs [11, 12]. The transformation of bactericide to the nontoxic form is mediated by enzymes that provide resistance to biofilm. Few species of bacteria reported for degradation of the toxic compounds such as aromatic, phenolic and other heavy metals (nickel, cadmium, mercury, antimony, silver, copper, zinc, lead, cobalt, etc. . Detoxification usually occurs by enzymatic reduction of ions and metal resistance genes. The presence of heavy metals induced the broader spectrum of resistant phenotype . The heterogeneities in an adapting population increase the chances that at least some individuals meet immediate or future challenges . The growth rate and metabolic activity of the bacteria are affected by the differences in nutrients and oxygen availability within biofilms. The level of bacterial growth and activity inside biofilm was proved by different concentration of metabolic substrates and products . Clostridia bacterium provides the valuable information for growth and fermentation in different cultivation condition . This leads to heterogeneity of microbial population. The metabolic activities of cells were promoted by nutrients and oxygen in the periphery region of biofilm, which supports to bacteria in proliferation. In contrast, due to poor diffusion of nutrients, limits the metabolic potential inside niche resulted slowly growing the cells inside the biofilm matrix . This was performed by the accumulation of guanine nucleotide-guanosine 3,5’-bis-pyro-phosphate (ppGpp) and the decreased level of RNA (tRNA and rRNA) synthesis. The concerning information on metabolic and growth rate heterogeneity of cells comes from the cellular enzyme synthesis within the biofilm . The changes in the bacterial growth cycle influenced the level of enzyme synthesis in proportional to cell mass . In stationary phase or slow growing bacteria cellular enzyme synthesis is arrested . Biocides kill the metabolically active bacteria, whereas at the dormant growth phase, bacteria are less susceptible to the antimicrobial agents and protect them from the antimicrobial action . However, in E. coli dormant growth phase synthesizing 1A- dependent ppGpp that suppresses the activity of autolysin and limits the cells anabolic process . A mutation in relA gene does not affect the growth rate, and such population was more sensitive to antibiotics. The population of relA mutants inhibits peptidoglycan synthesis, which reduced the levels of activity of the bacteria cell wall inhibitors . The increasing tolerance of bacterial biofilms towards antimicrobial agents reinforced the idea of metabolic growth rate heterogeneity. The metabolic activities are controlled by oxygen availability within biofilms. In Pseudomonas aeruginosa, bacterial biofilm is killed in pure oxygen when given ciprofloxacin and tobramycin antibiotics, however, reduction of oxygen availability enhanced the antibiotic resistance [25, 26]. Bacterial biofilm also increases the level of resistance against antibiotics through expressing specific genes under the anaerobic conditions. Persisters are the population of antimicrobial agent tolerant cells and are responsible for the severe chronic infectious disease. The detection of the bacterial strains are the major challenge in clinics. The study on ATP dependent persister formation conclude that lowering the ATP level decreases antibiotic target activity which leads to persister formation . Bacterial biofilm contains resistant persister cells that exhibit multidrug and bactericidal agent tolerance . Late growing gram positive or negative bacteria leading to tolerance or persistence, may exhibit to multidrug resistance and antibiotic tolerance. Persisters cells formation controlled by the growth stages of bacterial communities, which are rapidly propagated and survive in the presence of lethal doses of antimicrobial agents . Stationary phase bacteria produced a high level of persister cells and correlated with the increasing resistance inside biofilm . The immune system eliminates the antibiotic action inside planktonic population, which is survived by persister cells . Glycocalyx matrix helps the biofilm persisters to protect the immune system. After termination of the antibiotics in sessile bacterial population, persister cells start again re-inducing the growth of bacterial biofilm . The stages of bacterial growth decided the formation of persisters . One of the studies proves that persisters are in a loss if the stationary phase diluted . The persisters’ formation also depends on the metabolic activity of bacteria  and suggested that persisters are a dormant variant of the wild type, not mutant cells. Interestingly, persisters not responded to bactericidal agent exposure . Persisters compete for the antibiotic targets for the production of multidrug resistance (MDR) protein . It is noteworthy that antibiotics act as a bactericidal with disrupting the function of target cells, rather than inhibition. Antibacterial compounds were leads to cell damage. The tolerance phenomenon of persisters has also been linked with programmed cell death (PCD) while the action of antimicrobial compounds leads the cell towards damage but not for complete cell death, which indirectly triggers PCD [35, 37]. Inside biofilm, autolysis is also the most common observation, which is performed by the peptidoglycan hydrolases called as autolysin . Recently, Kirby-Bauer disk diffusion test was studied in late growing bacteria which detect the bacterial resistance and evaluate the level of tolerance by replacing the antibiotic disc impregnated with nutrients . Biofilm resistance has been explained by the imposition of biofilm-specific growth within biofilm . The physiological state of cells and the nature of the habitat can lead to considerable variation in the receptiveness of bacteria to bactericides. The limiting availability of nutrients affects the barrier composition and changes the bacterial cell envelope. After biofilm exposure to the inhibitory concentration of bactericides, resistant cell population leads to phenotypic adaptation. The heat or starvation stress in E.coli induces expression of resistance to UV light or H2O2. Another example of Enterococcal strains, after oxidative stress induction up regulate the expression of antioxidative enzymes and down regulate of prooxidative enzymes . However, resistant phenotype becomes lost upon removal of bactericide. This has been suggested that a limitation of nutrient in biofilm causes to slow-growth and enter in the starved state . The treatment with antimicrobial agents to biofilm leads to loss of their respiratory action due to their activity near the biofilm-bulk fluid interface. When the cells expanded as high growth rate rich media, the non-growing cells are less vulnerable to a variety of antimicrobial agents . The genetic adaptation is required within biofilm to reduce susceptibility and to adopt the relatively protected and distinct phenotype. The multiple antibiotic resistance (mar) operons is a global regulator which controls the expression of various genes in E. coli and support multi-drug resistant phenotype includes antibiotics, organic solvents and the other disinfectants . Moreover, M. tuberculosis adopts a dormancy state for decades in stressful environmental conditions and unrecognized by anti-TB drugs . Most of the bacteria are fermentative, produces oxidant degrading and repairing enzymes and exhibit oxidizing stress response. These stress response cells become more resistant to a harmful factor within hours of exposure to sub-inhibitory quantities factor. Several defense genes have been characterized in E. coli, encoding catalysts; superoxide dismutases, hydroperoxide reductases, and alkyl glutathione reductases as well as DNA repair enzymes . In addition, various regulatory genes such asoxyR and soxR have been characterized, which determine intracellular redox potential and activate a stress response when cells are subjected to oxidizing agents. Quorum sensing (QS) is a process of the cell-to-cell interaction that regulates the behavior of bacteria. It depends upon extracellular signal molecules, detection, production, and autoinducers. Reboule et al. explore the family of molecules which belongs to natural compound that inhibited QS via antagonism of the receptor . The bacteria by induction of a particular set of genes are capable of sensing and responding to increased cell population density . Quorum sensing includes the production and secretion of an acyl homoserine lactones (AHL), which diffuse through the cell wall from the cell to the medium . In gram-positive bacteria, quorum sensing secretes peptides as signal compounds and a two regulatory system (membrane-bound histidine kinase receptor and an intracellular response regulator) to detect the required changes in gene expression pattern and the peptides . Besides, autoinducers-2 is another form of quorum sensing mechanism. These mechanisms are found in both gram-positive and negative bacteria . The active cells in bacterial growth influenced by the glycocalyx matrix and degradative enzymes that regulate signaling molecule production such as S-adenosyl methionine and acyl-carrier proteins . The mechanism of quorum sensing also reported in the control of biofilm maturation . The role of signal molecule-mediated quorum sensing in biofilm formation has been demonstrated in many bacterial species. Quorum sensing systems influence the heterogeneous architecture of biofilm for the regulation of the degradative enzymes synthesis. Moreover, in suitable nutrient supply and environment, the expression of quorum sensing mediated phenotype is crucial in the cell migration and also protects from the deleterious environment of new modes of growth . In Aeromonads, three QS regulate the expression of a function including biofilm formation, motility, and virulence and harbor the differences in other influences . Signaling mechanism from cell-to-cell in Pseudomonas aeruginosa, controls the expression of superoxide dismutase and catalase genes, which mediate the resistance to hydrogen peroxides . The quorum sense deficiency is correlated with thinner biofilm formation and lower EPS production, and such a mutant or deficient biofilm is susceptible to kanamycin . These studies suggested that quorum-sensing system responded to biofilm either directly or indirectly to environmental stress . Another study of Pseudomonas aeruginosa shown, that it kills the other competing bacteria through the 2-heptyl-3-hydroxy-4-quinolone signal using stored bacterial iron. The previous study on Pseudomonas quinolone has also shown higher affinity signal with iron chelator. Schertzer et al. found the similarity in action between glycocalyx matrix and signal molecules to trap external positive-charged compounds . As antibacterial agents have to penetrate to reach the target site; modification of cell envelope or adaptation is found to be responsible for bacterial cell resistance to antibiotics. Hydrophilic antibacterial agents are mainly prevented from entering through the outer membrane by the lipopolysaccharide layer and the underlying phospholipids, whereas outer membrane proteins exclude hydrophobic agents. Moreover, Gram-positive bacteria (Nocardia farcinica) has a complex cell wall and bind to a variety of lipids and pore-forming proteins and form a hydrophilic pathway across the cell wall and exhibited in interaction with the antibiotics. The role of mycobacterial resistance to antibiotics in outer-membrane is indispensable . Certain antibiotic-resistant bacteria strain either lack or over express outer membrane proteins. For example, P. aeroginosa strain lacks Opr D, a porin selective for certain carbon sources , which are the port of entry for isothiazolone. Alteration in the outer membrane protein profile leads to the exclusion of bactericide sodium dimethyl dithiocarbonate (SMT). A set of efflux systems facilitates bacterial survival under extreme conditions, including antimicrobial agents. Efflux pumps exert both intrinsic and acquired resistance to different antibacterial agents that belong to same or different families [64, 65]. 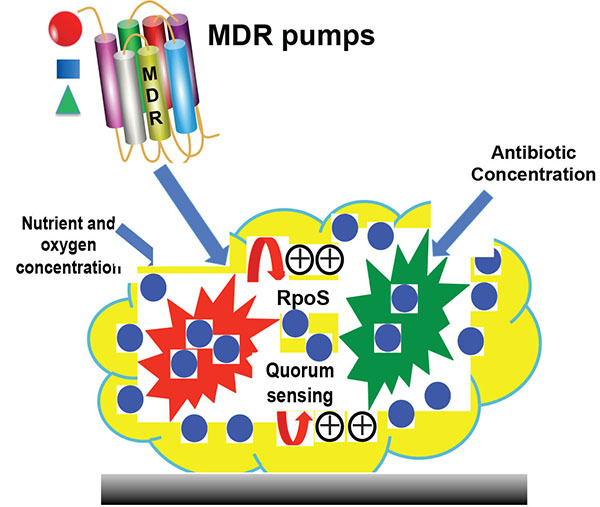 Overproduction of efflux pump can lead to multidrug resistance. Bacterial efflux pumps exert multidrug resistance (MDR) phenotype combined with other resistance mechanisms such as target modification and antibiotic inactivation [66, 67]. Acinetobacter baumannii is a major challenge in the hospital, which is reported in multidrug resistance, that persists in the environment, and forms a biofilm on wound surface . Besides, gram-positive bacteria (Bacillus subtitles, L. lactic, S. aureus and etc.) also causes severe human infections due to resistance behavior towards antimicrobial agents . These possess multiple drug resistance mechanisms and transport multiple unrelated compounds that result a multidrug resistance (MDR) phenotype. In several pathogenic bacteria such as Escherichia coli (E. coli), Enterobacteraerogenes and Klebsiella pneumonia, the efflux pump slows down the penetration of hydrophilic solutes that decrease the transmembrane diffusion of lipophilic solutes by down-regulating the ‘porin’ production [70, 71]. Several studies have reported the localization of the efflux pump-encoding genes on either chromosome of plasmids exerting resistance to various antibiotics as well as biocides, dyes, and detergents . Five different classes of bacterial efflux pumps have been identified such as the major facilitator superfamily (MF), the resistance-nodulation-division family (RND), the small multidrug resistance family (SMR), the ATP-binding cassette family (ABC) and the multidrug and toxic compound extrusion family (MATE) . To drive antimicrobial agent efflux, the ABC family system hydrolyses ATP, whereas the MF family, MATE family, and the RND family functions as secondary transporters, catalyzing drug ion antiproton (H+ or Na+) . RND family transporters are the first line of defense in bacteria by serving the target mutation or drug modification. Exposure of the bacterial biofilm to lower concentrations of antibiotics, such as chloramphenicol and tetracycline and to xenobiotic such as salicylate and chlorinated phenols, induces the expression of multi-drug resistance operons and efflux pumps [75, 76]. DNA microarray analysis of mature Pseudomonas aeruginosa PA01 biofilm demonstrated that none of the genes encoding the RND efflux system when induced in sessile bacterial population grown in antibiotic-free environments [77, 78]. Similarly, multidrug resistance phenotype in E. coli biofilm is regulated by mar and acrAB encoding genes. Several antibiotics such as penicillin’s, cephalosporin’s, rifampicin, nalidixic acid and fluoroquinolones and oxidative stress agents up regulate mar in planktonic bacteria exerting a resistance phenotype . In addition, sub-lethal doses of several commonly used medicinally important antibiotics such as tetracycline; chloramphenicol, salicylate and paracetamol can induce mar expression level [80, 81]. The acrAB efflux pump determined the multidrug resistant phenotype of mar mutant isolates and also reported as up regulated in mar mutants . Lower susceptibility of E. coli biofilm to sub-lethal doses of ciprofloxacin is enhanced through constitutive expressions of acrAB efflux pump. In addition, the stationary phase of bacterial growth is related to the expression of mar and its target genes. It was observed that metabolic activity of bacteria was highly suppressed with the higher expression level of mar in E. coli biofilm. Mutants of Pseudomonas aeruginosa with increased expression of efflux pumps play a significant role in decreasing susceptibility of Pseudomonas aeruginosa biofilm to antibiotics . The Efflux pumps are the major hurdles in drug discovery and the main player in multidrug resistance of gram-negative bacteria. The recent advances in the understanding of efflux pumps could provide the drug discovery platform in bacteria . Several factors contribute to being the development of resistance to bacteria in biofilms and varied among microorganisms (Fig. 1). Antibiotics have been widely used at the variable concentration in worldwide that may affect the microbiota, consequences of that alteration of genes, mutation, drug resistance and also human health . However, Biofilm is more protective and resistance to the action of antibiotics. It is important to remark that surface associated infections (prosthesis, catheters, lung, etc.) increased by bacterial colonization and physiological alteration inside biofilm. The device related infections are major hurdles in the treatment of the patient that expose to high tolerance antibiotics. The bacteria originated from biofilm can spread into bloodstream or other infection. Thus, bacteria embedded in a biofilm are able to withstand to antibiobiotics and influence the patient management. Moreover, Gram-positive and Gram-negative bacteria form highly tolerant persisters in the biofilms, which inferred the high risk of that infection recurrence during biofilm infections . Intensive research on the regulation of gene expression is currently ongoing that provides recognition and transfer of multidrug efflux proteins. The increased antibiotic resistance of biofilm is due to (i) limited diffusion of antimicrobial agents through the biofilm matrix, (ii) communication of the antimicrobial agents with the biofilm matrix (polymer and cells), (iii) enzyme-mediated resistance, (iv) levels of metabolic activity inside the biofilm, (v) genetic adaptation, (vi) efflux pumps and (vii) outer membrane structure. The antibiotic resistance is supported due to the transition of the colony from exponential to slow or without growth/persisters phenomena. The Glycocalyx matrix through the efflux system and enzymes, inactivate antimicrobial agents and protect the peripheral region of the biofilm. Interestingly, cells in the intermediate position of a biofilm, starve for a particular nutrient and slow their growth. The changes at various gene expression levels due to stress response to severe conditions prevent the surface-bound bacteria from cellular damage. A detailed mechanism of biofilm resistance can be investigated by isolating the antibiotic-resistant bacteria occurring in the biofilms. Also, new investigations will improve patient health and survival, the complex interaction between the biofilm communities and the host defense system. Fig. (1). Mechanisms of resistance in bacterial biofilm. This study was supported in part by the NIH Award Number SC1CA193758 and 5G12MD007602. Donlan RM. Biofilms: Microbial life on surfaces. Emerg Infect Dis 2002; 8(9): 881-90. Anderl JN, Franklin MJ, Stewart PS. Role of antibiotic penetration limitation in Klebsiella pneumoniae biofilm resistance to ampicillin and ciprofloxacin. Antimicrob Agents Chemother 2000; 44(7): 1818-24. Bryers JD. Bacterial biofilms. Curr Opin Biotechnol 1993; 4(2): 197-204. Windler M, Leinweber K, Bartulos CR, Philipp B, Kroth PG. Biofilm and capsule formation of the diatom Achnanthidium minutissimum are affected by a bacterium. J Phycol 2015; 51(2): 343-55. Flemming HC, Wingender J. Relevance of microbial extracellular polymeric substances (EPSs) Part I: Structural and ecological aspects. Water Sci Technol 2001; 43(6): 1-8. Costerton JW. Structure and plasticity at various organization levels in the bacterial cell. Can J Microbiol 1988; 34(4): 513-21. Peña J, Bargar JR, Sposito G. Role of bacterial biomass in the sorption of Ni by biomass-birnessite assemblages. Environ Sci Technol 2011; 45(17): 7338-44. Sutherland IW. The biofilm matrixan immobilized but dynamic microbial environment. Trends Microbiol 2001; 9(5): 222-7. Anwar H, Dasgupta MK, Costerton JW. Testing the susceptibility of bacteria in biofilms to antibacterial agents. Antimicrob Agents Chemother 1990; 34(11): 2043-6. Sugano M, Morisaki H, Negishi Y, et al. Potential effect of cationic liposomes on interactions with oral bacterial cells and biofilms. J Liposome Res 2016; 26(2): 156-62. Hoyle BD, Jass J, Costerton JW. The biofilm glycocalyx as a resistance factor. J Antimicrob Chemother 1990; 26(1): 1-5. Brown SM, Howell ML, Vasil ML, Anderson AJ, Hassett DJ. Cloning and characterization of the katB gene of Pseudomonas aeruginosa encoding a hydrogen peroxide-inducible catalase: purification of KatB, cellular localization, and demonstration that it is essential for optimal resistance to hydrogen peroxide. J Bacteriol 1995; 177(22): 6536-44. Kümmerle N, Feucht HH, Kaulfers PM. Plasmid-mediated formaldehyde resistance in Escherichia coli: characterization of resistance gene. Antimicrob Agents Chemother 1996; 40(10): 2276-9. Ryall B, Eydallin G, Ferenci T. Culture history and population heterogeneity as determinants of bacterial adaptation: the adaptomics of a single environmental transition. Microbiol Mol Biol Rev 2012; 76(3): 597-625. Stewart PS. Diffusion in biofilms. J Bacteriol 2003; 185(5): 1485-91. Kolek J, Branska B, Drahokoupil M, Patakova P, Melzoch K. Evaluation of viability, metabolic activity and spore quantity in clostridial cultures during ABE fermentation. FEMS Microbiol Lett 2016; 363(6): fnw031. Wentland EJ, Stewart PS, Huang CT, McFeters GA. Spatial variations in growth rate within Klebsiella pneumoniae colonies and biofilm. Biotechnol Prog 1996; 12(3): 316-21. Poulsen LK, Ballard G, Stahl DA. Use of rRNA fluorescence in situ hybridization for measuring the activity of single cells in young and established biofilms. Appl Environ Microbiol 1993; 59(5): 1354-60. Mitchison JM. Enzyme synthesis in synchronous cultures. Science 1969; 165(3894): 657-63. Sternberg C, Christensen BB, Johansen T, et al. Distribution of bacterial growth activity in flow-chamber biofilms. Appl Environ Microbiol 1999; 65(9): 4108-17. Gilbert P, Maira-Litran T, McBain AJ, Rickard AH, Whyte FW. The physiology and collective recalcitrance of microbial biofilm communities. Adv Microb Physiol 2002; 46: 202-56. Betzner AS, Ferreira LC, Höltje JV, Keck W. Control of the activity of the soluble lytic transglycosylase by the stringent response in Escherichia coli. FEMS Microbiol Lett 1990; 55(1-2): 161-4. Shigeta M, Komatsuzawa H, Sugai M, Suginaka H, Usui T. Effect of the growth rate of Pseudomonas aeruginosa biofilms on the susceptibility to antimicrobial agents. Chemotherapy 1997; 43(2): 137-41. Walters MC III, Roe F, Bugnicourt A, Franklin MJ, Stewart PS. Contributions of antibiotic penetration, oxygen limitation, and low metabolic activity to tolerance of Pseudomonas aeruginosa biofilms to ciprofloxacin and tobramycin. Antimicrob Agents Chemother 2003; 47(1): 317-23. Tresse O, Jouenne T, Junter GA. The role of oxygen limitation in the resistance of agar-entrapped, sessile-like Escherichia coli to aminoglycoside and beta-lactam antibiotics. J Antimicrob Chemother 1995; 36(3): 521-6. Shan Y, Brown Gandt A, Rowe SE, Deisinger JP, Conlon BP, Lewis K. ATP-dependent persister formation in Escherichia coli. MBio 2017; 8(1): e02267-16. Lewis K. Persister cells and the riddle of biofilm survival. Biochemistry (Mosc) 2005; 70(2): 267-74. Brooun A, Liu S, Lewis K. A dose-response study of antibiotic resistance in Pseudomonas aeruginosa biofilms. Antimicrob Agents Chemother 2000; 44(3): 640-6.
 del Pozo JL, Patel R. The challenge of treating biofilm-associated bacterial infections. Clin Pharmacol Ther 2007; 82(2): 204-9. Lewis K. Programmed death in bacteria. Microbiol Mol Biol Rev 2000; 64(3): 503-14. Lewis K. Persister cells, dormancy and infectious disease. Nat Rev Microbiol 2007; 5(1): 48-56. Keren I, Shah D, Spoering A, Kaldalu N, Lewis K. Specialized persister cells and the mechanism of multidrug tolerance in Escherichia coli. J Bacteriol 2004; 186(24): 8172-80. Falla TJ, Chopra I. Joint tolerance to beta-lactam and fluoroquinolone antibiotics in Escherichia coli results from overexpression of hipA. Antimicrob Agents Chemother 1998; 42(12): 3282-4. Keren I, Kaldalu N, Spoering A, Wang Y, Lewis K. Persister cells and tolerance to antimicrobials. FEMS Microbiol Lett 2004; 230(1): 13-8. Shockman GD, Daneo-Moore L, Kariyama R, Massidda O. Bacterial walls, peptidoglycan hydrolases, autolysins, and autolysis. Microb Drug Resist 1996; 2(1): 95-8. Gilbert P, Allison DG, Evans DJ, Handley PS, Brown MR. Growth rate control of adherent bacterial populations. Appl Environ Microbiol 1989; 55(5): 1308-11. Brown MR, Allison DG, Gilbert P. Resistance of bacterial biofilms to antibiotics: A growth-rate related effect? J Antimicrob Chemother 1988; 22(6): 777-80. Gefen O, Chekol B, Strahilevitz J, Balaban NQ. TDtest: easy detection of bacterial tolerance and persistence in clinical isolates by a modified disk-diffusion assay. Sci Rep 2017; 7: 41284. Joo H S, Otto M. Mechanisms of resistance to antimicrobial peptides in staphylococci. Biochim Biophys Acta 2015; 1848(11 Pt B): 3055-61. Vlková B, Szemes T, Minárik G, et al. Food-borne enterococci and their resistance to oxidative stress. J Microbiol 2011; 49(4): 657-62. Maira-Litrán T, Allison DG, Gilbert P. An evaluation of the potential of the multiple antibiotic resistance operon (mar) and the multidrug efflux pump acrAB to moderate resistance towards ciprofloxacin in Escherichia coli biofilms. J Antimicrob Chemother 2000; 45(6): 789-95. Farr SB, Kogoma T. Oxidative stress responses in Escherichia coli and Salmonella typhimurium. Microbiol Rev 1991; 55(4): 561-85. Williams P, Winzer K, Chan WC, Cámara M. Look whos talking: communication and quorum sensing in the bacterial world. Philos Trans R Soc Lond B Biol Sci 2007; 362(1483): 1119-34. Sgaragli G, Frosini M. Human Tuberculosis II. M. tuberculosis mechanisms of genetic and phenotypic resistance to anti-tuberculosis drugs. Curr Med Chem 2016; 23(12): 1186-216. Suntharalingam P, Cvitkovitch DG. Quorum sensing in streptococcal biofilm formation. Trends Microbiol 2005; 13(1): 3-6. Talagrand-Reboul E, Jumas-Bilak E, Lamy B. The social life of aeromonas through biofilm and quorum sensing systems. Front Microbiol 2017; 8: 37. Platt TG, Fuqua C. Whats in a name? The semantics of quorum sensing. Trends Microbiol 2010; 18(9): 383-7. Newton JA, Fray RG. Integration of environmental and host-derived signals with quorum sensing during plant-microbe interactions. Cell Microbiol 2004; 6(3): 213-24. Parsek MR, Val DL, Hanzelka BL, Cronan JE Jr, Greenberg EP. Acyl homoserine-lactone quorum-sensing signal generation. Proc Natl Acad Sci USA 1999; 96(8): 4360-5. Watnick P, Kolter R. Biofilm, city of microbes. J Bacteriol 2000; 182(10): 2675-9. Abee T, Kovács AT, Kuipers OP, van der Veen S. Biofilm formation and dispersal in Gram-positive bacteria. Curr Opin Biotechnol 2011; 22(2): 172-9. Shih PC, Huang CT. Effects of quorum-sensing deficiency on Pseudomonas aeruginosa biofilm formation and antibiotic resistance. J Antimicrob Chemother 2002; 49(2): 309-14. Weinberg ED. Iron availability and infection. Biochim Biophys Acta 2009; 1790(7): 600-5. Schertzer JW, Boulette ML, Whiteley M. More than a signal: non-signaling properties of quorum sensing molecules. Trends Microbiol 2009; 17(5): 189-95. Lee S, Hinz A, Bauerle E, et al. Targeting a bacterial stress response to enhance antibiotic action. Proc Natl Acad Sci USA 2009; 106(34): 14570-5. Lee IS, Lin J, Hall HK, Bearson B, Foster JW. The stationary-phase sigma factor sigma S (RpoS) is required for a sustained acid tolerance response in virulent Salmonella typhimurium. Mol Microbiol 1995; 17(1): 155-67. Xu KD, Franklin MJ, Park CH, McFeters GA, Stewart PS. Gene expression and protein levels of the stationary phase sigma factor, RpoS, in continuously-fed Pseudomonas aeruginosa biofilms. FEMS Microbiol Lett 2001; 199(1): 67-71. Brown MR, Barker J. Unexplored reservoirs of pathogenic bacteria: protozoa and biofilms. Trends Microbiol 1999; 7(1): 46-50. Drenkard E. Antimicrobial resistance of Pseudomonas aeruginosa biofilms. Microbes Infect 2003; 5(13): 1213-9. Singh PR, Bajaj H, Benz R, Winterhalter M, Mahendran KR. Transport across the outer membrane porin of mycolic acid containing actinomycetales: Nocardia farcinica. Biochim Biophys Acta 2015; 1848(2): 654-61. Brözel VS, Cloete TE. Resistance of Pseudomonas aeruginosa to isothiazolone. J Appl Bacteriol 1994; 76(6): 576-82. Hogan D, Kolter R. Why are bacteria refractory to antimicrobials? Curr Opin Microbiol 2002; 5(5): 472-7. Liaw SJ, Lee YL, Hsueh PR. Multidrug resistance in clinical isolates of Stenotrophomonas maltophilia: roles of integrons, efflux pumps, phosphoglucomutase (SpgM), and melanin and biofilm formation. Int J Antimicrob Agents 2010; 35(2): 126-30. Davin-Regli A, Bolla JM, James CE, et al. Membrane permeability and regulation of drug influx and efflux in enterobacterial pathogens. Curr Drug Targets 2008; 9(9): 750-9. Bolla JM, Alibert-Franco S, Handzlik J, et al. Strategies for bypassing the membrane barrier in multidrug resistant Gram-negative bacteria. FEBS Lett 2011; 585(11): 1682-90. Richmond GE, Evans LP, Anderson MJ, et al. The Acinetobacter baumannii two-component system AdeRS regulates genes required for multidrug efflux, biofilm formation, and virulence in a strain-specific manner. MBio 2016; 7(2): e00430-16. Schindler BD, Kaatz GW. Multidrug efflux pumps of Gram-positive bacteria. Drug Resist Updat 2016; 27: 1-13. Li XZ, Nikaido H. Efflux-mediated drug resistance in bacteria. Drugs 2004; 64(2): 159-204. Pagès JM, James CE, Winterhalter M. The porin and the permeating antibiotic: a selective diffusion barrier in Gram-negative bacteria. Nat Rev Microbiol 2008; 6(12): 893-903. Markham PN, Neyfakh AA. Efflux-mediated drug resistance in Gram-positive bacteria. Curr Opin Microbiol 2001; 4(5): 509-14. Kumar A, Schweizer HP. Bacterial resistance to antibiotics: active efflux and reduced uptake. Adv Drug Deliv Rev 2005; 57(10): 1486-513. Poole K. Efflux-mediated antimicrobial resistance. J Antimicrob Chemother 2005; 56(1): 20-51. Levy SB. Active efflux mechanisms for antimicrobial resistance. Antimicrob Agents Chemother 1992; 36(4): 695-703. Ma D, Cook DN, Alberti M, Pon NG, Nikaido H, Hearst JE. Molecular cloning and characterization of acrA and acrE genes of Escherichia coli. J Bacteriol 1993; 175(19): 6299-313. Whiteley M, Bangera MG, Bumgarner RE, et al. Gene expression in Pseudomonas aeruginosa biofilms. Nature 2001; 413(6858): 860-4. Maira-Litrán T, Allison DG, Gilbert P. Expression of the multiple antibiotic resistance operon (mar) during growth of Escherichia coli as a biofilm. J Appl Microbiol 2000; 88(2): 243-7. Alekshun MN, Levy SB. Regulation of chromosomally mediated multiple antibiotic resistance: the mar regulon. Antimicrob Agents Chemother 1997; 41(10): 2067-75. Cohen SP, Levy SB, Foulds J, Rosner JL. Salicylate induction of antibiotic resistance in Escherichia coli: activation of the mar operon and a mar-independent pathway. J Bacteriol 1993; 175(24): 7856-62. Seoane AS, Levy SB. Characterization of MarR, the repressor of the multiple antibiotic resistance (mar) operon in Escherichia coli. J Bacteriol 1995; 177(12): 3414-9. Ma D, Cook DN, Alberti M, Pon NG, Nikaido H, Hearst JE. Genes acrA and acrB encode a stress-induced efflux system of Escherichia coli. Mol Microbiol 1995; 16(1): 45-55. Ma D, Alberti M, Lynch C, Nikaido H, Hearst JE. The local repressor AcrR plays a modulating role in the regulation of acrAB genes of Escherichia coli by global stress signals. Mol Microbiol 1996; 19(1): 101-12. De Kievit TR, Parkins MD, Gillis RJ, et al. Multidrug efflux pumps: Expression patterns and contribution to antibiotic resistance in Pseudomonas aeruginosa biofilms. Antimicrob Agents Chemother 2001; 45(6): 1761-70. Martínez JL. Effect of antibiotics on bacterial populations: A multi-hierachical selection process. F1000 Res 2017; 6: 51. Lebeaux D, Ghigo JM, Beloin C. Biofilm-related infections: Bridging the gap between clinical management and fundamental aspects of recalcitrance toward antibiotics. Microbiol Mol Biol Rev 2014; 78(3): 510-43.